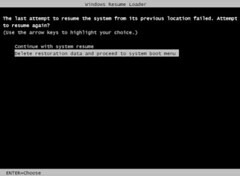 theatre of noise: Computer Frozen at Windows Resume Loader? Serves me right for bragging. A friend asked me yesterday how my new computer was getting on, the one I blogged about extensively in a four-part series starting here. I said "fine -- never had a problem" and then returned home to disaster. My power button is set to restore Windows 7 from hibernation, a great feature that pops up the OS in a second or two. Except that this time all I got was a faint grey screen. Had my monitor failed? Was it a loose VGA cable? Had my boot drive gone south? Was it a virus? No, in fact it was none of the above. Read on to figure out the solution and how you can recover from the cryptic screen posted above. After checking the video cable and noting that there was in fact a grey signal getting to the monitor (it was not totally black) I eliminated for the moment the possibility that the screen had broken. Then I tried the big blue power button on my Fractal Design case, but it was unresponsive. One limitation of this case is that there is no reset button, so I was forced to power off using the big switch on the back... not something to do lightly. After restarting the computer it went through the initial BIOS screens and then gave me something I have never seen before. The "Windows Resume Loader" screen presents two options: "Continue with system resume" and "Delete restoration data and proceed to system boot menu". Apparently this is a feature of Windows Vista and Windows 7. Since I am more familiar with Windows XP and had never used hibernation features before this year, I have been lucky enough to never encounter it. OK, so the hibernation info had somehow become corrupted. No problem, I'll just cursor down once to the second menu option and hit Enter. Except... no cursor keys. No Enter key. Keyboard acts frozen. Yikes! If this happens to you, here is the problem and its solution. Problem: At this screen the computer responds only to a PS/2 connected keyboard and you likely have a USB keyboard. Solution: Tell the BIOS you have a USB keyboard. So, reboot and immediately tap whichever key gets you into your BIOS setup. This might be F1 or F3 or Del or something else. Consult your BIOS manual (or check online) to see which it is. Or simply read the first screen where it will tell you -- but be quick! Once in your BIOS, you want to find a setting that reads something like "USB legacy support". My Gigabytes motherboard uses the Award BIOS, so I chose the top-level menu option "Integrated Peripherals", found the "USB Keyboard Support" item and turned it on. Don't forget to "Save" or "Save and Quit" out of your BIOS. The system will resume. This time when it gets to the "Windows Resume Loader" screen you can use the keyboard to choose the second option: "Delete restoration data". Windows will boot and all will be well. But here's the totally stupid, inanely dumb and incredible user-unfriendly part. In order to change the BIOS settings so it would recognize my USB keyboard I had to use my USB keyboard, which the BIOS did, in fact, recognise. In Windows the computer also recognises the USB keyboard with no special jiggery-pokery. It is only in between loading the BIOS and loading Windows that the computer will not recognise a USB keyboard unless you have explicitly told it to. What possible sense does that make? If this post has saved you anguish, please donate a small amount using the button in the sidebar. Thank you! THANK YOU This just saved my computer. THANK YOU THANK YOU. No money though sorry. Hey, no problem. Glad this helped -- that's the important thing. I did my head in on this problem until I found this page. Thanks mate! I was about to open my comp and start messing with the BIOS battery, when I came up to your post! It worked thank you! This is really something very odd that even exists... that one has to tell the computer that he is using USB keyboard! Unbelivable!! thgis DOESNT work if you cant get into your BIOS which i cant. what should I do now. cxan you help? I am sorry but if you cannot get into your BIOS then there is no solution. However some key should get you in... find a manual for your computer if you can. Or just try various keystrokes. Thanks for the info..this is exactly my issue. However I think my whole disk encryption is changing the settings..any advice? THANKYOU SO SO SO SO MUCH!!! I thought my computer was ruined! I found my BIOS and enabled my keyboard all thanks to you!! I was stuck on this problem until I found this! You literally saved me so much getting a computer guy out to fix it! I am glad this could help! A reminder to anyone who can help out... I have a donations button in the sidebar and really appreciate any amount. Currently money collected is going towards our heating fund -- it's a cold winter in Ireland! Once again u solve this problem! Great thanks from a harried wife who u saved from a frustrated husband ranting and raving! UgH! Just wanted to add something. I did the opposite because I have a laptop. I disabled USB legacy and the laptop keyboard unfroze. Hello I have the same problem.. did you ever find a solution by any chance? I sure hope so..
Diamond: What are you referring to? The article already outlines the solution! Thanks much for the advice. I followed it closely and even though I am not very handy with the technology, I was able to fix the frozen screen problem. Thanks bro. It works! Kudos to my hero! Glad to help! If you can, buy me a coffee with the donation link. Mmmmmmm, coffee. I have the same exact problem. But when I get into my BIOS, I do not see any option for USB keyboard as you described. The closest thing I see is 'Boot Order' which has things like CDROM, USB hard drive, and USB diskette on key. Can you help please? Answer: I am not sure if I can help since every BIOS is different. Check that there isn't an option somewhere for "legacy peripheral support" or something similar. You may have to page through a lot of items in your bios. Otherwise you might have to do this, as quoted from the article: "A more radical step is to open up your case and use the manual reset button (or jumper) on your motherboard to clear the BIOS." Thanks so much Phil. People like you make it all worth while! Happy to help. robin?! How can I solve it if I have a laptop? I don't have PS/2. Please fast reply or your contact with me(arti147@tlen.pl) THANK YOU! Anonynous: As noted above, you do not need a PS/2 keyboard. The solution should work with an attached USB keyboard (did for me) or indeed your built-in keyboard. Sorry, this is all I know. Good luck! This post is six years old. I am sorry but I do not have no further information to add. As my previous comment, I have nothing further to add to this post 7 years on. I hope you can find an answer elsewhere.